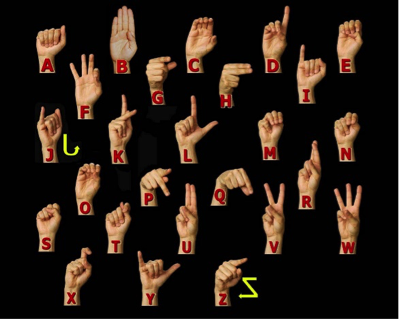 From sending silent messages to remembering trivia for school, knowing sign language can come in handy. 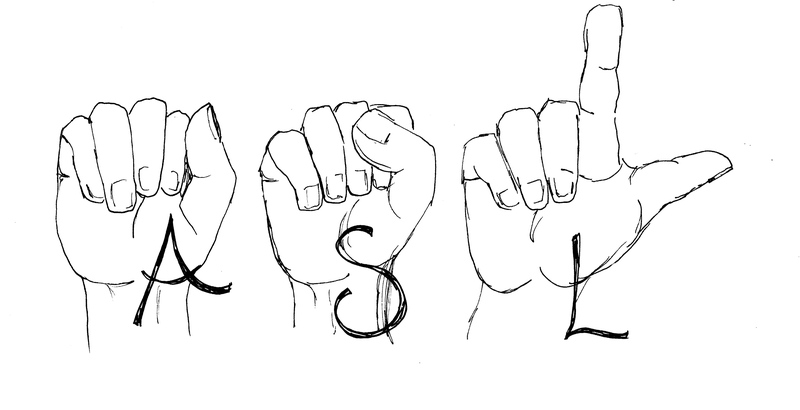 How do I know American Sign Language? Well, like every poor sap trapped in the public education system, I had to take a foreign language in high school, and ASL just sounded leaps and bounds more entertaining than Spanish, French and German combined. Take Spanish in high school, and you’re every Joe Lunchbox who can only string together a half-mediocre sentence three years after the class ends. Take sign language, and you’re a goddamn hand magician for the rest of your life. In fact, I’ve found myself fiddling the ol’ digits for the oddest of reasons, which usually have nothing to do with communication at all—although that could be due to my lack of frequent human interaction in general. But that’s beside the point! Ahem. Let’s just get into it, shall we? No, not that kind of whipping it out. Honestly! Not that I’m an expert on social gatherings in any capacity, but when it comes to ASL, I have done my share of showing off in my day. Since your regular passerby Jim-Bob has no knowledge of fingerspelling whatsoever, people tend to be quite impressed when you can twist out your name in one fluid motion so fast they blink and miss it. To non-signers, lightning-quick fingerspelling looks like this super complicated secret signal that must require tons of dexterity and be nigh impossible to read. Admittedly, deaf people are the real masters—some of those guys’ hands just fly through the air like nobody’s business—but anyone can get good enough for it to be impressive with a little practice. If you get really cozy and familiar with the ASL alphabet, becoming a walking human spelling bee actually takes no thought at all; after a while, your fingers just jump right into it as if they’d been waiting to twitch out the words “biological oceanography” from the womb. And people will think you’re way cooler than you are, trust me. Nothing says “be my friend” quite like thrashing your phalanges in a stranger’s face, am I right? How did I stuff this numbingly unnecessary minutia into my brain? Why, I used sign language. Signing out each date takes about two seconds, and it could not possibly be more helpful for people who require more…eccentric methods to keep those extraneous details from flowing straight out of their orifices. Associating an otherwise meaningless piece of information with its corresponding wacky hand flutter makes it easier to recall later, because your body does the remembering for you. Another example: During the AP Government & Politics exam back in high school, I remembered that the 19th Amendment gave women the right to vote because the sign for “19” looks like a classy sophisticate in the 1920s sipping tea with her pinky up. I had a friend in high school who took ASL with me, and every now and then we’d surreptitiously sign each other answers to the bell work from our assigned seats on opposite ends of the room in world history class. No better reason to learn sign language than to fudge yourself the capital of Portugal. I’m not saying cheating is good, per se—please, don’t let me be the final judge on moral rectitude—but it sure is handy. On a less scandalous note, ASL is also incredibly convenient in loud, crowded places. When you find yourself in the middle of a pizza place at rush hour sandwiched between Screaming Stranger #1 and Belligerently-Defying-Polite-Physical-Boundaries Stranger #2, the ability to let your friend the counter know you want curly fries with that with just a flick of the wrist is a godsend. Not to mention that you can finally talk while you eat without rightly offending everyone within a ten-foot radius, whether you hold the entire conversation silently or just sign bits and pieces in between bites. No more awkward silences, because—ha—the whole thing is an awkward silence! 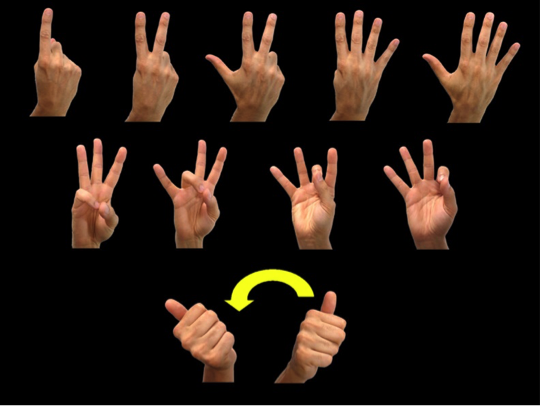 Here’s a weird thing about counting in sign language. You know the seemingly universal sign for “3,” holding up your three middle fingers? Yeah, in ASL, that’s not 3—that’s 6. To count past 5 in ASL, you don’t break out your second hand like a proud first-grader who can name all the colors of the rainbow; you just touch one of your other fingers to the tip of your thumb. Pinky and thumb is 6 (not 3), ring finger and thumb is 7, middle finger and thumb is 8, and index finger and thumb is “OK sign” 9. Then 10 is a wiggled thumbs up, and 11-19 are just twitchy versions of 1-9. Unfortunately, that’s where the logic gets flushed right down the toilet, as the 20s are total unequivocal nonsense. 20 is a baby bird cheeping for a worm, 21 looks like the work of a trigger-happy sniper—and don’t even get me started on the random letter Ls thrown in there just for fun. But that’s neither here nor there. The important thing is that you can do it all on one hand, even the hundreds and thousands, until you hit infinity! Which I assume would be a sideways 8 drawn in the air. ASL can be rather literal sometimes. You wouldn’t know it if you’d never been exposed to Deaf culture before, but damn, can deaf people assemble! Those fancy finger acrobats are everywhere—at school, on the Ferris wheel, on the roof, under your bed. (Check, I dare you. You never know.) I’ve run into several deaf acquaintances just at the grocery store—and that doesn’t even include ASL clubs, Deaf socials, signed theatre performances. My point is, despite all the colorful ways in which deluxe appendage flourishing can enhance your daily life, knowing sign language will likely come in handy with real-life people as well. And lemme tell ya, it’s a whole lot more convenient for everyone when you can sign back to a deaf person instead of just marveling at their picture-making hands like a dummy and a half. Indeed, if you can fight your carnal urge to run from social contact, you might even make some new friends. Not that I know what those are.